#Blockchain heralds a new railway age? Last week, I suggested that digital currencies might be the new portals. Reflecting further on my work with Brave New Coin*, it also occurs to me that the growth of Blockchain resembles the railway mania of 19th century Britain. Hopefully it won’t end in the same over-investment and asset bubble – but there are some interesting similarities. 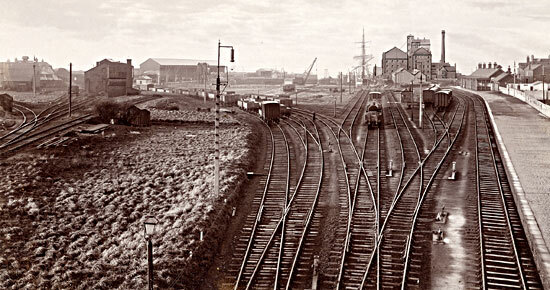 First, the railways displaced the canal system, just as canals overtook roads as the key means of transportation. For these purposes, if we compare roads to the Internet, and canals to the World Wide Web, then Blockchain is the next generation of the “information superhighway”. Blockchain and distributed ledger technology, along with crypto-currencies, digital assets and smart contracts are powering the “new” internet – the Internet of Things, the Internet of Money, the Internet of Value Exchange. Second, and in a similar vein, the Internet was designed primarily as a means of communication. Then, the web enabled e-commerce, content distribution and on-line interaction. Now, Blockchain technology is supporting a range of new activities – such as tokenizing tangible and intangible assets; securing personal data and financial accounts; decentralizing networks, exchanges and registries; and validating immutable transaction data. Third, the proliferation of public, private and permissioned Blockchains is prompting the development of technical standards for the design, architecture, security and taxonomy associated with this technology – as railway systems have implemented common safety and operating standards. There is also the need for interoperability between Blockchains, just as railway networks have had to address different track gauges among competing operators. Of course, on the downside, railway mania led to heightened speculation, failed or over-optimistic prospectuses, and duplication of competing networks as developers sought to secure the most lucrative routes. And let’s not overlook the issue of forking, which Blockchains are having to address in order to meet the demand for increased processing capacity and/or to iron out potential design weaknesses. In some ways this resembles the creation of railway branch lines – in some cases, these subsidiary routes would become more important than their parent main lines; and may even have outlived them, following the Beeching restructures in the 1960s. Finally, for all the benefits that Blockchain undoubtedly holds, challenges remain with “on-ramp / off-ramp” access – a bit like disconnected transport interchanges or uncoordinated train timetables. Next week: Long live experts…. Students don’t need to attend formal classes anymore – they can YouTube a tutorial, sign up for a MOOC, watch a TED talk, Google the answer to a question, or research a Wiki entry. And that’s just the free stuff. Online seminars and workshops, especially in the area of software programming and code writing, are big business; and even vocational courses are looking to deliver more content via the web. This week is the final part in my mini-series on the Three Pillars. (See Health and Finance.) Of the three, Education has probably done the most to embrace online – it’s certainly been at the forefront of the Internet and the web, both of which have their roots in academia. Yet of the three, it is the one vertical segment that is most vulnerable to disruptive technologies and changing business models. Lifelong learning is going to become vital in keeping ourselves informed, skilled, up-to-date, relevant and employable (whether as hired labour or as self-employed freelances). Even in retirement, services like the University of the Third Age (U3A) can help in maintaining our mental wellbeing. Few of us establish long-term relationships with schools or educational establishments we have attended – at best, we may join an alumni group, but in my experience, many such organisations are designed around fund-raising activities, “old boy” networks, quasi-masonic rituals and/or sadomasochistic memory recall at the annual reunion; and they don’t do so well when former students become increasingly mobile in the global workplace. On the other hand, the ability to attend so many different educational establishments and be exposed to different types of education services makes for a richer learning experience. Online academic reference and research services have been around since the 1980s, and it’s now possible to source post-grad dissertations and PhD papers via vast online library databases. Part of this is driven by the academic need to “publish or perish”, part by changes in the publishing and information industry, part by the need to foster collaboration via better dissemination of primary research. For myself, I participated in my first online seminar about 15 years ago, and webinars are commonplace for professional development, distance learning and collaborative projects. I have also enrolled in online tutorials for one-off courses on very specific topics – less about getting a qualification, more about enhancing my knowledge. Mass Open Online Courses (MOOC) are a logical extension of the webinar model – but of course, you don’t get the same certificate or diploma you would receive (assuming you get one at all) if you had enrolled for the class, completed the assignments and passed the exams. Some universities and colleges license their content (syllabus and curriculum) for local delivery by another institution – a bonus for students in remote locations, or unable to access more expensive colleges. Maintaining the integrity and quality of this “distributed” learning is still a challenge, and mutual recognition of qualifications (as well as certification and authentication) may yet be a barrier to student mobility. Ultimately, the role of lifelong learning is in helping to plan, manage and develop our careers. Just as we might have a financial plan (to prepare for the future), and we would expect to manage our health (via regular check-ups and preventative measures), why wouldn’t also have a career plan, supported by a learning pathway? And if we are increasingly comfortable accessing content via mobile apps and the web, why wouldn’t we expect to pursue our learning needs online as well? If it seems too good to be true, then it must be! As someone who commissioned one of the first books on advance fee fraud (sometimes called ‘Nigerian 419’ scams) nearly 20 years ago I find it staggering that people are still being sucked into these ‘get rich quick’ schemes. While ‘advance fee’ is a particular type of bank fraud, those spammy and ubiquitous e-mails offering you fantastic sums of money in return for simply providing your personal details (and/or a small upfront payment and the ‘loan’ of your bank account) are among the more common form of financial scams on the Internet. In most cases, the perpetrators (often posing as government officials, lawyers, bankers or accountants) claim to have unique access to enormous funds which need to be transferred out of their country of residence – usually in the context of foreign trade, bank deposits, bequests or international loan transactions. More recently, I have seen attempts to ‘liberate’ the proceeds of deceased estates where there is no legitimate heir. Advance fee fraud scams should seem obvious by now, and hopefully recipients are wiser about these dubious offers to make them wealthy beyond their wildest dreams. Yet, I can’t help feeling these predatory fraudsters are merely an extreme version of the contemporary snake oil salesmen that inhabit the business world today. Other variants of these ‘get rich in 10 easy lessons’ programmes are business ownership opportunities (mostly outsourced telesales operations), seminars on how to flip real estate (some of which are now illegal unless provided by licensed financial planners), and courses where you learn to build websites for clients (but your only customers end up being people who want to learn to build websites for their clients….). Call me sceptical, but many of these ‘systems’ are merely pyramid sales schemes (sorry, MLM plans) masquerading as ways to “Be your own boss and kick the 9-5 routine”. Sure, some of these programmes may be free to access, but the likelihood is that the person offering ‘valuable’ business insights on how you can make your fortune is making their money from ‘selling’ the programme to you (via third-party advertising, sponsorship, speaking engagements, etc.). If these insights are so valuable, why are they giving them away?